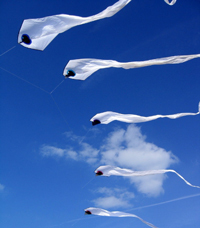 We use a wide range of kites in our displays. 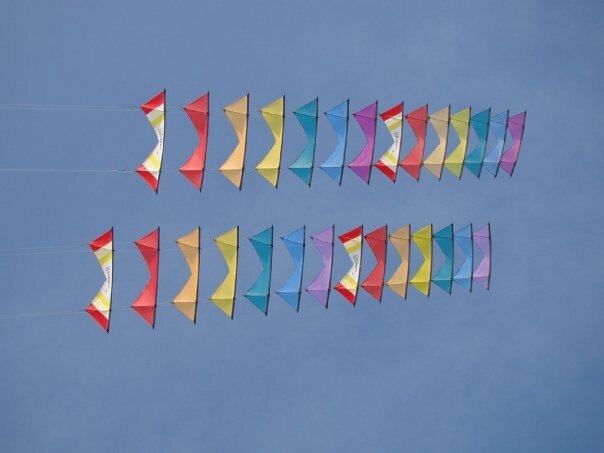 Choosing different kites for different winds we are able to display in the widest of conditions. Whether we are flying our range of single line kites or performing one of our many choreographed kite ballet routines, we only choose the best. Revolution kites were the first and still the best choice of four line kites. These incredibly maneuverable and robust kites are perfect for our formation team displays. With their unique flying abilities we are able to create elaborate formations and patterns and even stack them together to make ground sculptures. In partnership with Revolution Kites, two Spanish brothers Pedro & Esteban Gonzalez have perfected the art of printing art work directly onto kites. 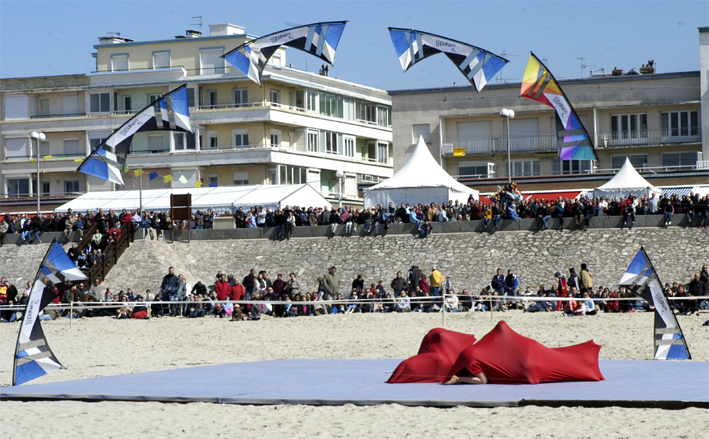 This technique allows us to have our own unique designs on our kites. The Flying Squad are proud to have been the first kite team in the world to use these amazing creations and boy do they look good! Take a close up look at the detail to really appreciate these kites. 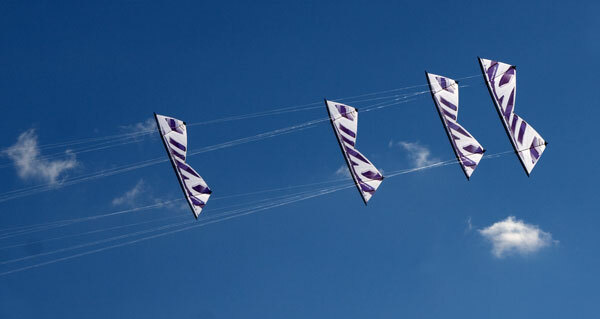 Barry Poulter has been making kites since 1991. He is well known for his beautiful single line kites using intricate applique work. Bazzer recently teamed up with Revolution Kites to produce a “Master Series” of their Revolution 1.5 kite. The Team are delighted to have a set of these distinctive kites, the design of which inspired the layout on our printed Revolutions. Geraint Thomas has designed a dual line kite for The Flying Squad to use as a team kite. It’s precision and maneuverability make it ideal for the team’s dual line routines. 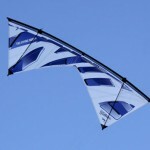 Its strong graphics and flyability make this a popular kite with the team. 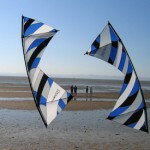 A smaller freestyle version of the kite is expected soon. 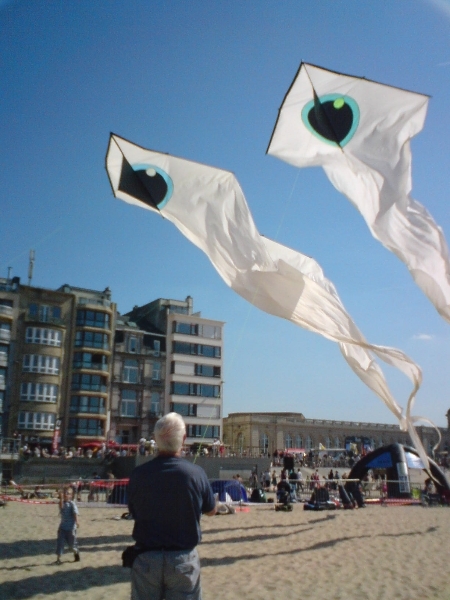 Carl Robertshaw is perhaps the UK’s most famous and prolific kite designer and maker. 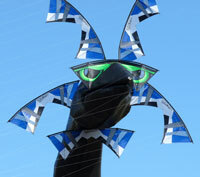 As well as being a multiple World Champion sport kite flyer, Carl is famous for his Serpent Delta Kites. These beautiful kites are graceful and stable during the day, but ethereal and elegant when flown at night under spot lights.